Share "Why Do My Fish Keep Dying and How Can I Prevent It?" Fish can be delightful pets, with their brilliant colors and soothing swimming motions, but it can be unnerving and distressing when fish die for no apparent reason. There is always a reason, however, and understanding the most common causes of aquarium fish deaths can help fish owners prevent mortal mishaps in their tanks. Causes of Aquarium Fish Mortality – And How to Prevent Them! New Tank Syndrome: Before a tank has developed the appropriate chemistry to support healthy fish, heavy concentrations of nitrates and ammonium in the water can be fatal. In time, natural bacteria in the water will balance out these contaminants, but until that balance is achieved, fish may die unexpected. To Prevent: Test a new tank regularly for nitrate and ammonium levels, and change the water as needed to reduce levels so they are safe for fish. Rapid Water Changes: In a healthy, established tank, water chemistry is carefully balanced with resident fish, plants, and bacteria. Quickly changing large quantities of the water will disrupt that chemistry and shock fish, causing death. Water does need to be changed occasionally, but sudden, large changes will be harmful. To Prevent: Change water slowly, swapping only small quantities at a time and waiting 2-3 days before changing more water so the fish can acclimate to gradual chemistry changes. Water Quality: The overall water quality in a tank is a key component in fish health. The salinity of the water (for saltwater aquariums), pH levels, filtration efficiency, and other quality issues must be maintained within ideal levels, or any one of them could be responsible for dead fish. To Prevent: Research the appropriate water quality for your fish, and take steps to maintain suitable quality levels to safeguard fishes' health. Temperature Changes: Most fish can tolerate a range of temperatures in the tank, but sudden or dramatic temperature changes can cause stress, which will make the fish more susceptible to illness. Very drastic changes can be quickly fatal. To Prevent: Check the tank heater for proper function daily, and position the tank away from anything that might affect its temperature, such as heating or cooling vents, sunny windows or drafty areas. Unexpected Toxins: Even small amounts of toxic contaminants can be fatal to fish, such as bug spray, hand lotion, perfume, soap, cleaning chemicals and other seemingly innocuous materials. If the water becomes contaminated with these items, fish will suffer. To Prevent: Protect the tank from unintentional contamination by using a good cover and keeping toxins well away from the tank. Always wash your hands with unscented, non-antibacterial soap before reaching into the water for any reason. Overfeeding: Fish do not need three meals a day, and overfeeding not only wastes food, but spoiled food can contaminate the tank and unbalance its delicate chemistry. 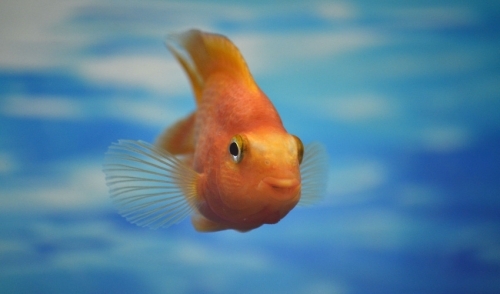 Fish only need a few mouthfuls of food each day, and even though they may beg, they do not need additional treats. To Prevent: Plan a strict feeding schedule and do not deviate from that schedule. Adjust feeding quantities until the fish consume all the food in 1-2 minutes, and do not feed them extra. Unhealthy Fish: If fish were already stressed out, sick, or in poor condition before being introduced to a tank, even the best aquarium conditions may not keep them alive. To Prevent: Know the symptoms of common diseases for fish you want to purchase, and always buy fish from experienced, reputable breeders or dealers. Select only the healthiest fish in the best condition so they will better be able to withstand the stresses of transportation and incorporating into a new tank. Keeping fish can be a great experience, and knowing why fish may die keeps that experience great by avoiding the most common causes of aquarium fish deaths.